This Week's TV: Tricia Helfer stars in possibly the worst thing ever made. Plus the Ultimate Clone Wars Battle! It's November sweeps, which means the shocking twists are coming fast and furious on your favorite TV shows — including a terrible decision on The Walking Dead, and some uncanny twists on Fringe. But meanwhile, Battlestar Galactica's Tricia Helfer is guest-starring in the worst piece of television you'll ever see. Ever. Also, we've got brand new clips from Terra Nova, The Walking Dead, Fringe and Star Wars: The Clone Wars. Get the jump on your television week right here! "Fangs a Lot Johnny" – Susan and Mary discover Gil's a fan of the latest teenage vampire saga, so they transform into vampires to get his attention. Johnny and Dukey turn vampire hunter to rescue Gil and turn Johnny's sisters back to normal. "Johnny Trick or Treat" – Johnny and Dukey spend the night in a haunted house to win a ton of candy, but can they survive the night? "Nightmare on Johnny's Street"– In their latest plan to win Gil's heart, the twins invent a machine that makes dreams come true. One problem, their little brother "borrowed" it and thanks to his nightmares, Johnny now has to conquer the monsters that are destroying Porkbelly! That's followed at 7:30 PM by the Amazing World of Gumball Halloween special. And then at 8 PM, there's a spooky new episode of Adventure Time, in which: "Finn and Jake receive an invitation to a masquerade dinner. It turns into a whodunit as guests start to meet their demise." And then at 8:15, there's a special 30-minute Regular Show Halloween special. Also at 8 PM: Nicktoons has a new episode of Iron Man: Armored Adventures, "Enter: Iron Monger." But also, there's an all-new Terra Nova on Fox at 8 PM, "Bylaw". It's the "Murder by Dinosaur" episode: "The colony falls victim to its first murder, and Jim and Taylor must find the perpetrator. Also, Skye helps Josh find a way to get Kira, his girlfriend from 2149, to the past, while Elisabeth and Zoe race to help an unborn Ankylosaurus survive." Here's a thrilling sneak peek. And then at 10 PM there's another episode of Castle on ABC, "Cops & Robbers." Also at 10 PM: FX is having a Halloween marathon of American Horror Story, showing the first four episodes back-to-back. At 10 PM, H2 has another episode of The Universe, "The Sun's Evil Twin." Yes, there's another sun, only with an eyepatch and a sinister beard. 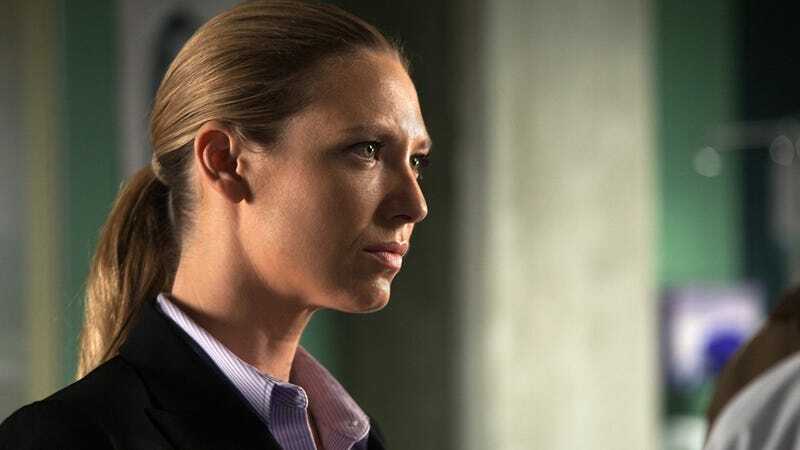 Also at 10 PM, CBS has another episode of Unforgettable, the show about the cop with the perfect computer brain. And then at 9 PM, in most markets, PBS has a new Nova, "The Fabric of the Cosmos: What is Space?" Hosted by Brian Greene. Space, far from being empty, is filled with some of the deepest mysteries of our times. There's an all-new Mythbusters on the Discovery Channel at 9 PM, followed by an all-new Penn & Teller Tell a Lie. Halloween night concludes with Tate coming face-to-face with his past. Ben and Vivien are haunted by one of the house's newest guests. Another option at 10 PM: a new episode of Psych on USA, "The Amazing Psych-Man & Tap-Man, Issue 2." And at 10:30 PM, Mad Scientists is all about a basketball-playing robot. With help from Elena (Nina Dobrev) and Bonnie (Kat Graham), Alaric (Matt Davis) tries to decipher the meaning behind his recent discovery Elena (Nina Dobrev) and Rebekah (guest star Claire Holt) engage in a mean-girl power struggle, until Rebekah finally reveals some of her family's ancient secrets and the violent past she shares with Klaus (Joseph Morgan) and Elijah (Daniel Gillies). Damon (Ian Somerhalder) tries a reckless new approach to make a breakthrough with Stefan (Paul Wesley), and they're both surprised by an unlikely ally. A second option at 8 PM: Community offers a class in "Advanced Gay." Also at 8 PM: another new The Big Bang Theory on CBS at 8 PM, "The Isolation Permutation." And then there's one of the last ever episodes of Charlie's Angels on ABC, also at 8. Then at 9 PM, CBS has another episode of Person of Interest, "Witness." After not hearing from her grandmother (Ashley Crow) for a couple of days, Cassie (Britt Robertson) becomes concerned and wants to go look for her. Diana (Shelley Hennig) decides the entire Circle should go in case Jane is in trouble. She also invites Jake (guest star Chris Zylka) along, much to Adam's (Thomas Dekker) dismay. A storm turns the day trip into an overnight excursion, so Faye suggests a little game of Truth or Dare to liven up the evening. However, things take a horrible turn when Faye is forced to reckon with someone from her past. And then at 10 PM, there's the fifth season premiere of Burn Notice, "Damned if You Do." Also at 10 PM: A new episode of Stan Lee's Superhumans on the History Channel, focusing on the "Shark Master." And then at 8 PM, there's another episode of Chuck, on NBC, "Chuck Vs. The Bearded Bandit." CHUCK ASSUMES THE ROLE OF MORGAN'S HANDLER, AS CARMICHAEL INDUSTRIES FACES NEW BUSINESS COMPETITION - CARRIE-ANNE MOSS ("THE MATRIX") GUEST STARS AS 'GERTRUDE VERBANSKI' - JEFF FAHEY AND JUSTIN HARTLEY ALSO GUEST STAR - As the team takes on a missing persons case, Chuck (Zachary Levi) and company struggle to establish themselves as Carmichael Industries in the face of a rival security firm led by the tough and efficient Gertrude Verbanski (guest star Carrie-Anne Moss). Meanwhile, Morgan (Joshua Gomez) continues to adjust to the Intersect while Chuck adjusts to being his handler. Also, the Buy More finds an unlikely spokesperson to help drum up business. But that's not all! Cartoon Network has a brand new Star Wars: The Clone Wars, "The General"
While in prison, Ryan (guest star Noah Bean) discovers patterns that reveal how Oversight gets its funding. Ryan arranges a meeting with Nikita (Maggie Q) to fill her in, but Amanda (Melinda Clarke) intercepts their coded messages to each other and alerts Oversight, who sends in one of their own to interrogate Ryan. Nikita and Michael (Shane West) scramble to break Noah out of prison before Oversight gets to him. Meanwhile, Alex (Lyndsy Fonseca) is being tailed by Gogol, and comes face to face with someone from her past. Or for another alternative at 8 PM, Disney Channel has a brand new Wizards of Waverly Place ("Rock Around the Clock"), followed at 8:30 by a new A.N.T. Farm ("Ignorants is Bliss"). Also, at 8:30 PM, Cartoon Network has a brand new Thundercats, "Sight Beyond Sight." At 9 PM, NBC has an all-new Grimm, "Bears Will Be Bears." A HOME INVASION REVEALS A FAMILY'S BARBARIC HISTORY - KATE BURTON ("GREY'S ANATOMY") GUEST STARS - A case of breaking and entering introduces Nick (David Giuntoli) and Hank (Russell Hornsby) to a mysterious family whose cultural background blurs the line of right and wrong. Meanwhile, Nick tasks Monroe (Silas Weir Mitchell) with safeguarding Aunt Marie (guest star Kate Burton). There's also a new Fringe at 9 PM on Fox, and it's the episode we were supposed to see last week, "Novation." The Fringe crew deal with the ramifications of a certain dude turning up naked in a lake, knowing tons of classified info — and meanwhile, the new shapeshifters are back. In the aftermath of recent shocking events, things really escalate when the translucent shapeshifters return. As the threat and circumstances intensify, former Massive Dynamic scientist Malcolm Truss (guest star Arye Gross) enters the fold. Meanwhile, Nina Sharp pays Walter a visit in the lab. Sam (Jared Padalecki) and Dean (Jensen Ackles) investigate the gruesome murders of resident mediums in Lily Dale, the most "psychic" town in America. They discover that an angry spirit is killing off the psychics one by one, but in a town full of people who claim to be summoning spirits, they have a little trouble identifying the medium controlling the ghost. But also, BBC America has the season finale of Bedlam at 9 PM, "Burning Man." A troubled spectre of Bedlam's past ends up being freed by Molly. Kate and Jed have to deal with some unspeakable demons in the Secret Room. And then at 11 PM, Disney XD has a new (to us Americans) episode of Naruto Shippuden, "The Target Appears"
Mrs. Claus' mission to find Christmas spirit for her stressed-out husband also ignites a family, torn apart by divorce, to rediscover the power of love just in time for Christmas in "Mistletoe Over Manhattan," a Hallmark Channel Original Movie World Premiere, Sunday, November 6 (8p.m. ET/PT, 7C). Tricia Helfer ("Battlestar Galactica," "Burn Notice"), Greg Bryk ("Happy Town," "History of Violence"), Tedde Moore ("The Kennedys") and Mairtin O'Carrigan ("The Boondock Saints II: All Saints Day") star in the inspiring holiday story. Meanwhile, ABC has another chapter of Once Upon A Time at 8 PM, "Snow Falls." MARY MARGARET PAYS A VISIT TO A COMATOSE JOHN DOE IN THE HOSPITAL, AND PRINCE CHARMING UNEXPECTEDLY MEETS SNOW WHITE FOR THE FIRST TIME BACK IN THE FAIRYTALE WORLD, ON ABC'S "ONCE UPON A TIME" - At Henry's urging, Emma convinces Mary Margaret to pay a visit to a comatose John Doe in the hospital and to read to him from the storybook. But Mary Margaret is stunned at the outcome of her visit. Meanwhile, back in the fairytale world, Prince Charming meets Snow White for the first time in a most unexpected way. And then at 9 PM, there's another episode of The Walking Dead, "Cherokee Rose." Also at 9 PM, Discovery Channel has a new Curiosity, "Life Before Birth." It's hosted by Courteney Cox!